As the UK counts down to the Queen’s Diamond Jubilee and Olympic celebrations, security concerns will be at a record high. In recognition of this, IFSEC International (www.ifsec.co.uk), the world’s largest annual security and fire event, announces its support of the aims behind National CCTV Improvement Week (6 – 12 May 2012) and encourages all security practitioners, business owners and proprietors, or anyone who has an involvement with CCTV, to test and review their current security camera installations to ensure they are operating efficiently. In line with the objectives of the TRUSTED© CCTV Improvement Project, National CCTV Improvement Week has been set to help determine and redress many everyday security camera concerns, experienced by a wide range of CCTV users and operators. 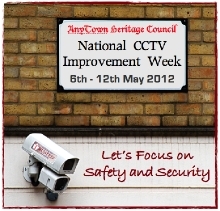 On behalf of National CCTV Improvement Week, UK CCTV Advisor Doktor Jon said: "In recognising the aims of NCIW 2012, it's highly gratifying to have such an outstanding, world-leading security event as IFSEC International, supporting the key objectives that will help CCTV users focus on safety and security. “It's vitally important for all video surveillance systems to work effectively, particularly where they may be called upon to later provide evidential recordings in serious crime and terrorism related investigations, and this is obviously a key consideration for a huge number of visitors to IFSEC International. A broad range of organisations and sectors are thought likely to benefit from participation in the UK's first National CCTV Improvement Week 2012, including Local Authorities, hospitals, schools, colleges and universities, retailers, banks and building societies, petrol retailers, hotels, shopping centres, commercial premises, museums, airports, train and bus stations, sports stadia, pubs and bars, department stores and leisure parks. Visitors to IFSEC International will have the opportunity to hear about the latest innovations in the CCTV market from the industry’s leading manufacturers and solutions providers including Panasonic, Samsung, Sony, Tyco, Dallmeier, Canon, Honeywell Security, JVC, IndigoVision, Norbain SD, Pelco and Axis Communications. Over 140 hours of free education are available at this year’s IFSEC International including the brand new Next Generation CCTV & Surveillance Theatre which will give an insight into the solutions which you could be using to protect your business. Topics include ‘Expanding & Upgrading Your Security Solution’, ‘Should lighting conditions dictate camera quality’ and ‘Advances in CCTV Lighting’, as well as insightful case studies from Network Rail and Imperial College Healthcare NHS Trust. IFSEC International will also showcase its new How Lighting Affects Surveillance – Demonstration Area which will demonstrate how different lighting conditions affect surveillance from low lighting/ambient conditions to complete darkness. It will highlight the difficulties faced and provide effective solutions through IR Illumination, thermal and night-vision technologies. Visitors will witness camera technologies from Merit Lilin, Samsung, Tyco and Genie utilising CCTV lighting from specialist Raytec. To register for a free ticket to attend IFSEC International, or for further information, please visit www.ifsec.co.uk/preview , follow us on Twitter @IFSEC or become a member of the IFSEC LinkedIn Group. National CCTV Improvement Week is being developed by UK CCTV Advisor Doktor Jon, as an initiative under the ongoing TRUSTED© CCTV Improvement Project. NCIW 2012 is the first time that a national campaign has been launched to encourage CCTV Users to health check, and where necessary improve their security camera systems.